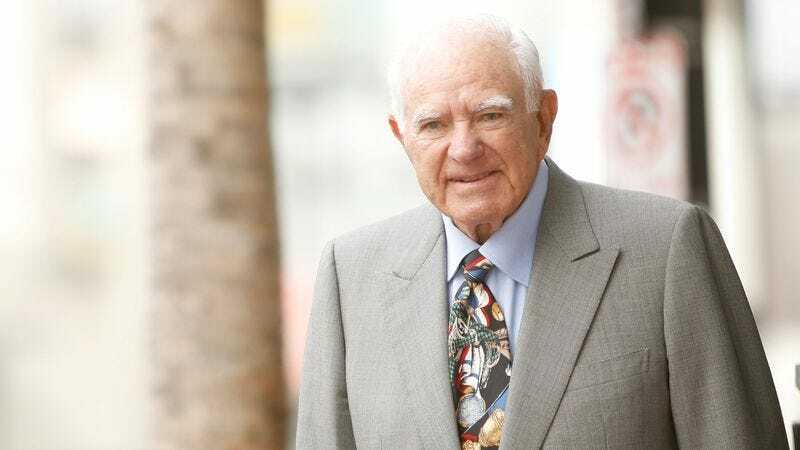 As reported by the Associated Press, The People’s Court’s Judge Joseph Wapner has died. No cause of death has been given, but TMZ says that he was hospitalized last week with “breathing problems” and his condition had worsened since then. He was 97. Though his tenure on the bench of The People’s Court is his most famous contribution to popular culture, Wapner actually served as a real judge for 20 years, spending most of that time on the Los Angeles County Superior Court. In 1981, two years after retiring from his previous judicial position, Wapner found himself presiding over The People’s Court. On that show, his folksy, no-nonsense demeanor—certainly informed by his decades of real-world experience—helped make the show into a massive hit, not only creating the whole courtroom-based reality show genre but jumpstarting reality TV in general. As a Washington Post story explains, the basic setup of The People’s Court was that small-claims disputes from the L.A. area would agree to have their cases settled outside of a traditional court and would sign a “legally binding arbitration contract.” Wapner would often base his judgement on straightforward factors like pre-existing agreements between the parties or whatever would be the most even-handed approach, giving the whole show a sense of consummate fairness that occasionally seemed to go against Wapner’s own gruff attitude. Wapner hosted The People’s Court for 12 years, leaving the show in 1993 when it went on a four year hiatus. The series eventually returned without him, but by that point a number of competing judge shows had popped up and The People’s Court was no longer as unique as it had once been. Wapner remained a pop culture figure, though, later going on to host an Animal Planet show called Judge Wapner’s Animal Court. Judge Wapner is survived by his wife, two sons, four grandchildren, and one great-granddaughter.